It’s no secret that we love colour around here. Like, really really LOVE it! And it will probably come as no surprise that we think weddings look even better when there is some colour in them, it just makes everything look so much more fun! As far as we are concerned colour will never go out of fashion, which is why today, we have rounded up our top fave colour blocking ideas! 1. We love everything about this backdrop over on 100 Layer Cake, from the geometric shapes to the bold pops of colour, this is one hell of a statement piece! 2. How totally gorgeous are these Colour Block Save the Dates. They are just the perfect way to set the tone for your wedding! 3. These colour block soaps via Brit & co would make fabulous favours! 4. 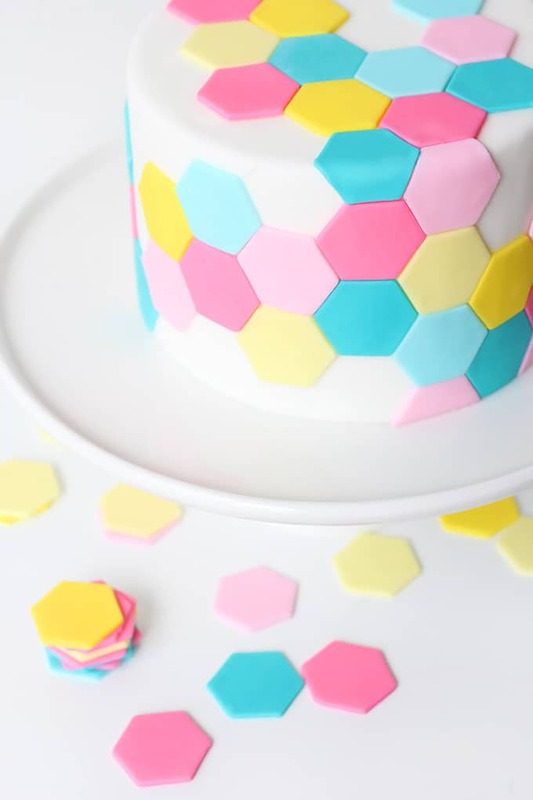 Colour blocked cakes are everything and this Pastel Hexagon Tile Cake via I Spy DIY is no exception, plus they are easier to make than you would imagine. 5. Colour Block Log Slices like these to brighten up an otherwise rather rustic trend. Don’t you just love the little coasters too! I would totally use these in my house! 6. These dipped Sugar Cookies via Love & Olive Oil look so yummy and would make great favours too! 7. Even the most boring home item can be made into a work of art with a splash of colour. Learn how to make these Colour Block Glass Bottles. 8. We couldn’t resist sharing this chocolate bark via Paper n Stitch Blog. Imagine this served on a sweet table or as favours? You’re guests would be so impressed! 9. Looking for a unique place name idea? We created these Concrete Test Tube Holders just for you! 10. You didn’t think we could do a whole post without including this colour blocked wedding dress via Green Wedding Shoes did you! The whole wedding is pretty magical but this dress is the bee’s! 11. Serve your guests dinner on these fun & colourful serving boards via Jess Love This Life. 12. Super simple and easy to make, this dipped cutlery via Delineate Your Dwelling would make any disposable flatware more stylish! 13. If serving dinner on blocks of wood doesn’t take your fancy, then how about this colour blocked dinnerware via B.Loved Blog? 14. I am seriously in love with these geo planters via Love + Color. They are such a cool and simple way to display succulents. So is this trend something you could imagine incorporating at your wedding? We would love to see how you do it?